AMarkets tops the list of well-established and reliable Forex brokers. For over 11 years the Company has been offering high-quality trading services and investment opportunities to clients around the globe, 24 hours a day. AMarkets’ core mission is to constantly refine its services to improve client profitability and offer the best trading conditions in the industry. up to 20 000 EUR per claim from the Financial Commission’s Compensation Fund. The Company puts the safety of its clients’ funds first. That’s why AMarkets was among the first to support the initiative of the Financial Commission and completed order execution verification with Verify My Trade (VMT), a partner of the Financial Commission. Anyone can click on the “Verify My Trade” Execution Certification icon and check out the latest execution audit date and its results. The standard account with no commission. The Broker has recently increased the maximum leverage to 1:1000 for this account type. Minimum trade size is 0.01 lot, step – 0.01. The account has no minimum initial deposit requirement, deposits can be made in USD, EUR and RUB. This account has fixed spreads starting from 3 pips. The maximum leverage reaches 1:1000. No fees and commission on deposit and withdrawal, deposits can be made in dollars, euros and rubles. The minimum initial deposit is not required. To trade on this account you will need to make a deposit of at least $ 200. There are practically no spreads since all trades are immediately routed to the interbank market, all trading operations are performed via Market execution. The commission on one lot is 5 euros or 5 dollars. The Company has recently lowered its minimum deposit requirement and increased leverage for this account type. The broker offers a wide range of bonuses and promotions to its clients. «Invite a friend». Each trader who invites his friends to AMarkets gets $10 for every referred friend, and all newly invited clients get a 25% trading bonus on each deposit over $100. To be eligible for this promotion, a trader must be at least 18 years old and have a verified trading account. «Double your trading deposit». 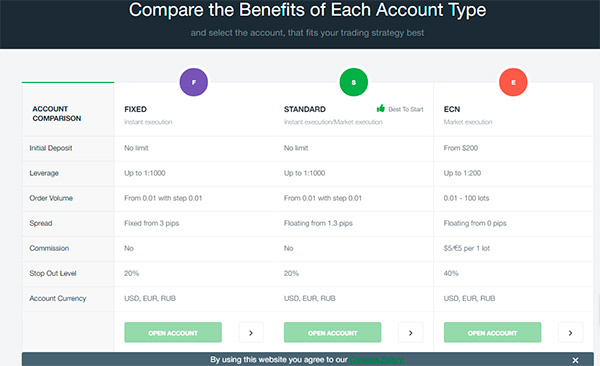 This offer allows new clients to double their initial deposit when they open their trading account with AMarkets. A new client opens a trading account, deposits any amount of funds and gets a 100% credit bonus on his deposit. Profit made with the bonus funds will be available for withdrawal once the required trading turnover is reached. 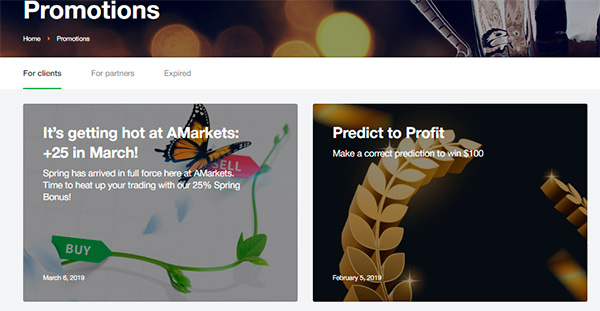 AMarkets has both seasonal and permanent bonus offers and promotions. The Broker has canceled its commission on deposit and withdrawal for all types of accounts – the offer is available once a month. AMarkets offers a highly lucrative multi-level partnership program for the website owners and partners. It’s an excellent way to receive stable payouts for the attracted clients’ trading activity. The Broker offers two models of cooperation – Agent and Webmaster. If you choose the «Agent» model, your commission will depend on the referred clients’ trading volume. Payouts are credited daily to the Partner wallet in the Personal Area and can be withdrawn via any of the available payment methods. 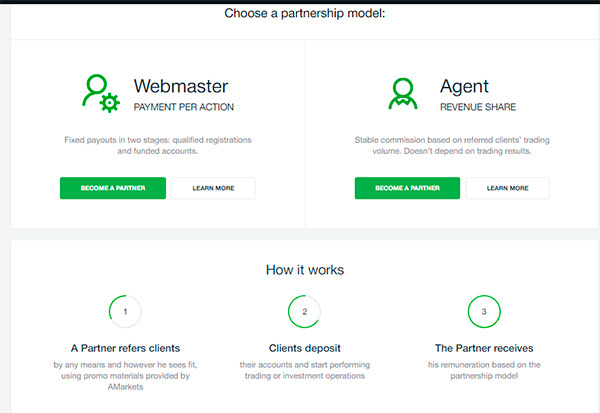 According to the Webmaster cooperation model, you’ll be getting fixed one-time payouts for each client’s registration. If the referred client funds his account and starts trading, the Webmaster will also get a reward. In the «Expert Advisors» section you can find various trading robots. Over 100 trading robots are available for download. Each EA comes with a description and given parameters, as well as the strategy tester data, which indicates the advisor’s effectiveness. All trading robots have been tested by the Company’s experts, and only the best performing EAs were included in the EA database. Trading robots are available to all registered clients. 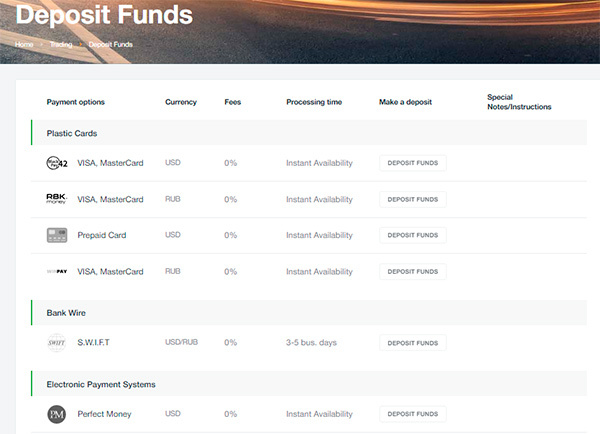 AMarkets offers a wide range of payment methods to deposit and withdraw funds from a trading account: Webmoney, Perfectmoney, FasaPay, Skrill, Neteller; VISA and MasterCard. Follow this link to find more information on deposit and withdrawal conditions at AMarkets. The Company recommends using the same payment method for your deposits and withdrawals. Striving for continuous improvement, the Broker keeps developing new services and products and introducing innovative technologies to keep a steady stream of new successful clients. Today AMarkets holds leading positions in terms of client success rate. The Company offers some of the best trading conditions in the industry – low spreads, ultra-fast order execution to trade currency, stocks and commodities. AMarkets’ experts have designed and developed signature indicators to facilitate the trading process. The Company offers various bonuses and promotions and provides daily analytics – all this indicates the customer-oriented approach. AMarkets makes its best effort to meet the needs of all its clients and to provide impeccable customer service.